During an interview for an entry-level job or an internship position, you might be asked to explain why you chose your college major. There is no right or wrong response to this question. However, you should be sure to give a well-rounded answer. When the interviewer asks about your major, use the opportunity to mention a few skills that relate to your chosen major, but would also be relevant in the workplace. Before you head out to your job interview, you really should prepare an answer to this common question. Read below for more tips on answering this interview question, as well as sample answers. When answering a question about your major, focus on the skills and experiences you gained from the major that are most related to the job. Even if your major is not directly related to the job, you can likely find connections between the two. For example, if you majored in English but are applying for a job as a paralegal, you might emphasize how you value the critical thinking skills you developed in the major and emphasize that these will be useful when conducting research at a law office. Take a moment to think about your college days. Write down a list of skills and experiences you gained through your major studies. Then, look back at the job listing. Circle any of your skills and experiences that relate to the requirements of the job. If you're having trouble coming up with any skills and experiences you gained through studying for your major, think back to assignments and projects from previous classes. Consider the skills you developed working on those projects. It may help to look back at course syllabi, which often include a list of "course goals" that might include particular skills. Another source of inspiration is your university or college’s website. Take a look at the webpage for your major. University and college websites often include a page on why that major is useful for students. If your major doesn't connect to the job you're applying for at all, this is also a chance to explain other ways you have developed skills that will fulfill the role you're applying for. For example, perhaps you were a theater major who is applying for a job in computer programming. You might explain that you took a number of online and extracurricular classes on programming to develop the skills needed for the job. If you need help finding a relationship between a job and your major, review this list of college skills you can use to connect your education with the skills required for the job. Keep in mind that while it’s important to connect your major to the potential job, you also want to be honest. An employer or interviewer will be able to tell if you are being insincere. Therefore, give an honest answer, but always tie that answer back to the job you’re applying for. Below are sample interview answers that you can edit to fit your personal experiences and background. I chose to be a nutritionist because I have always felt poor eating habits came from poor knowledge. I wanted to help people get healthy by teaching them about food, not telling them what they can and cannot eat. As an exercise science/nutrition major, I became an expert on getting and staying healthy and I cannot wait to work with clients. I'm looking forward to putting my excellent interpersonal skills and communication abilities to work in addition to all that I've learned from my courses. I decided to get my degree in elementary education because teaching was something that has always come naturally to me. I have always enjoyed spending time with children and when I am in the classroom I do not feel like I am working because I love being there! I feel my effective listening and patience really help me connect with kids. Being a writer is something I always dreamed of doing. However, I did not know exactly what type of writing I wanted to do and how I was going to make it my career. When I was deciding on where to focus my studies in college, I choose to follow the professional writing degree program. I knew from the very first intro class that it was the major for me. I have graduated with such a vast range of experience and knowledge. I feel just as comfortable writing for a newspaper as I do writing a speech for a politician, and I have had experience in both, thanks to my major. 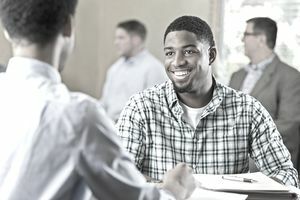 Interview questions about your college major are important, of course, but keep in mind you’ll be asked a number of questions about your skills, experience and other parts of your education. Review this article for potential entry-level interview questions and sample answers. When you’re a college student or recent graduate, it's important to relate your college education, extracurricular activities, and college experiences to the job for which you are applying.